If you're looking for a way to share large amounts of data across one small network, Western Digital has four new products you may want to investigate. 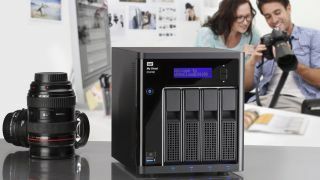 Built for computing enthusiasts and small business owners, Western Digital's new lineup of network attached storage (NAS) devices feature improved user interfaces and are based off the Linux operating system. The EX2100 and EX4100 are consumer-based NAS systems feature Dual-core Marvell Armada 385 & 388 processors. The EX2100 is built with 1GB of RAM and the EX4100 is built with 2GB of RAM. Both devices are capable of NAS to NAS replication, NAS to USB transfers and NAS to cloud sharing. The DL2100 and DL4100 are more powerful, small-business focused NAS systems based on Dual-core Intel Atom C2350 & C2338 processors with 1GB and 2GB RAM, respectively. Both machines feature dual gigabit Ethernet and power ports, AES 256-bit volume encryption and expansion up to 6GB of RAM and 24TB of hot-swappable capacity. Western Digital is hoping to capitalize on the increasing amount of digital data being created by individuals and small companies - and the need to easily share and backup that data. The new NAS devices are built for groups who want access to one pool of data across multiple laptops, tablets and smartphones, but don't have the time or capacity to upload everything to the cloud. This is particularly true for small businesses that require continuous data protection and backup, but can't afford the system downtime required to secure and duplicate data on systems that don't feature hot-swappable bays. The EX2100 starts at $249.99 (£151, AU$273) for a diskless unit, but can be customized for up to 12 TB of data for $749.99 (£453, AU$825). The EX4100 NAS starts at $399.99 (£258, AU$511) for the diskless unit, but can be customized for up to 24 TB of data for $1449.99 (£938, AU$1856). The DL2100 NAS starts at $349.99 (£225, AU$447) and goes up to $849.99 (£499, AU$900) for 12 TB. The DL 4100 starts at $529.99 (£342, AU$678) and can be built up to store 24 TB of data for $1529.99 (£1020, AU$2040) . All units are generally available globally. What is the best cloud backup solution?